WARNING: This module is no longer supported from the developer as the developer is shifting their focus on phpVMS v4 Addons. This is working on Simpilot's version of phpVMS 5.5? Yes. Working perfectly in mine. 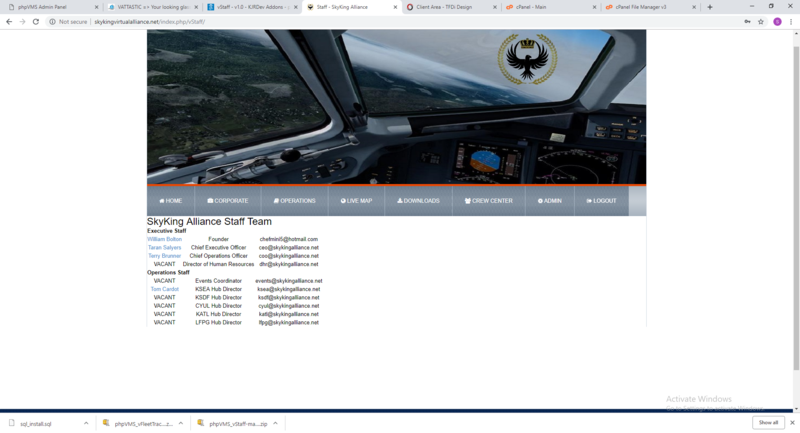 Hey just out of curiosity, what is the online staff page for and how do we see it? I should be blushing I am sure. More than likely I am just overlooking something here. I have this module and do not get that error on php 5.6. I would like to compare and see what we have. No it was my foult. I was trying to download .tpl version and i now i download .php version. So works perfect. Ok cool. Glad you got it sorted out. I'm giving administrative access to a pilot but the release is not appearing for him, but this is correct, he has released other pilots!